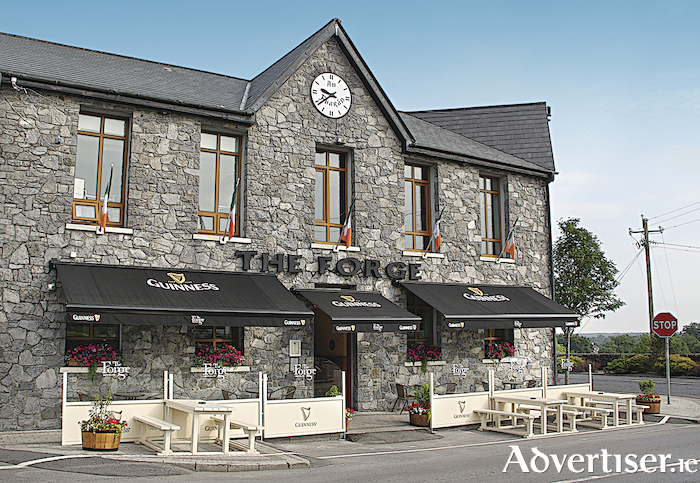 On the Galway side of Moycullen village, a landmark corner building is home to The Forge, a large pub, restaurant, and entertainment centre, with outdoor seating area for those warm days. Under the direction of Sinéad Carpenter and a team who live locally, The Forge succeeds in catering for the disparate demands of a mixed clientele, functioning not only as a neighbourhood gathering place for functions and parties, but as a competent restaurant operation - and also as concert, wedding, and entertainment centre. The modern building houses a bar with televisions and a restaurant on the ground floor, while the function room is upstairs. The restaurant is comfortably set up with well-spaced dining tables of solid bare wood offering a modicum of privacy, enhanced by lots of lamps, cosy corners with comfortable leather chairs and carpeted floors. While menus tend towards the predictable bar/restaurant style, what makes The Forge stand out is the amount of care taken with sourcing local produce, and the standard of cooking is reliably good. Expect tasty renditions of popular dishes such as chowder, sirloin steak, fish and chips, homemade bread and butter pudding, and homemade apple pie. It is a family-friendly place, too, with a separate children's menu and a pizza menu. The short wine list is well chosen and another highlight is the service by local waitresses, which is a delight. Open seven days, Monday to Saturday from 9am and Sundays from 11am, breakfast is served daily on Monday through to Saturday from 9.30am to 12noon. Carvery is available from 12noon to 4pm daily. The evening menu is from 4pm to 9pm daily and a take-away menu is also available seven days. For more information call 091 868944.